May | 2013 | DEBtastic Reads! I love to support authors, particularly ones I meet and like. I heard Julie Berry speak at a novel revision retreat I attended at Vermont College earlier this year. I picked up her book and recently dove in. One thing I admit is after years of reading MG and YA, I’ve grown impatient. I know there are tons of fabulous books out there. So when a book doesn’t capture my attention and draw me in within the first chapter, I often put it down. This was a book I could NOT put down! I adored the characters and didn’t want the story to end. Once wealthy and greatly loved by her parents who died in a carriage accident, 15-year-old Lucinda now works as a servant to her hen-pecked uncle and his second wife at their jewelry shop. 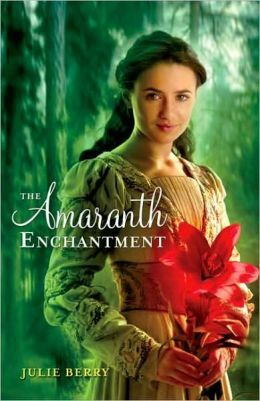 A mysterious woman shows up with a unique gem to be re-set, and Lucinda and her family are told she is the Amaranth witch. Aunt insists Lucinda return it lest the gem be a cursed, but Lucinda keeps it and what follows is fantastic fairy tale full of adventure, mystery, and romance. All my favorite things, plus a smart, loyal, and loveable goat named Dog. I shed tears and laughed out loud as I cheered for Lucinda to find true love and a happy ending. I’m waiting with great anticipation for Julie’s next book, a YA titled The Truth About Me, due out from Viking in September. Looks intense! It’s summer! Which means more time for reading! I’ve been making good progress getting through my TBR pile. Unfortunately, some books I’ve not been able to get through, which is always a disappointment. So, i’m asking you – what book/s would you recommend for me, knowing what you know about my reading tastes? (See my reading list on the right and here’s my 2012 reading list.) 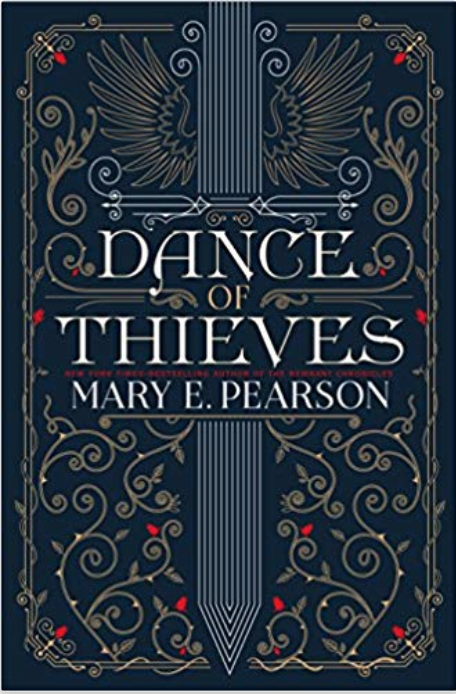 For summer, I tend to like lighter reads, but I also love diving into literary reads with lush writing as long as the characters are strongly developed and likeable. I avoid sad and/or depressing stories, although I can read a sad story as long as there’s some hope shining through. I’m not a huge fan of dark humor either. Okay – so give it to me! Looking forward to hearing what you recommend! Hello! Please grab your favorite mug and fill it with your favorite hot beverage and join me in welcoming author, Jody Feldman! Jody is the author of two fun adventurous middle grade novels, The Gollywhopper Games and The Seventh Level (HarperColins). I’m thrilled to be able to sit down with her (even if only virtually) to chat about her writing career! It wasn’t until one day about ten years ago. I was this-close to getting my first acceptance letter, or so the rejections said. But during my walk that day, in a moment of clarity, I came to understand how much I wanted to do this. That’s when I amped up my game, became more open to the revision process and ultimately succeeded. I’m glad I stuck with it because, for me, writing for kids is the Best. Job. Ever. The first book that got published was a work-for-hire, a gig that came from my freelance advertising days. Too bad I didn’t get royalties because A Golfer’s Night Before Christmas is still in print. Before that came a whole slew of picture books, but I’m not sure which one came first; maybe an easy reader called Grandma Waffles. After my picture book phase, I tried a chapter book which I would like to revisit one day. I believe Mrs. Oddbody Up the Street still has a lot of merit but I just didn’t know how to write back then. And then there was my first middle grade, originally titled Gilbert and the Gollywhopper Games. Ha! You and I have talked about this a lot, Debbi. It was long. Very long. From that first picture book submission to children’s book publication? 20 years and a huge learning curve. I’m still learning. The Gollywhopper Games wasn’t supposed to be a series, but sometimes funny things happen in this life. And so number two in the concept, Gollywhopper Games: Game On will be followed by Gollywhopper Games: (Subtitle To Be Determined). Game On centers around a contestant named Cameron who’s certain he doesn’t have what it takes to win. (His brother Spencer does.) And yet, Cameron’s the one competing. For those who still love the old contestants, never fear. They will make cameos. Of course I’m wiser about the industry. But I’d rather talk about what’s surprised me recently in my own writing process. I’ve suddenly noticed I’m much more aware of the ideas I’m accepting into first drafts. I hear my editors’ and agent’s voices as I type. Is there enough conflict? Are the stakes high enough? What does your character really want? Is that the best way to show it? Can you explain this scene a little better? You need to know that, but do we? It may take away a bit of spontaneity, but it compensates by delivering so much more clarity so much more quickly. There was this one teen book (they didn’t call them YA yet) which was a favorite of mine when I was about thirteen. It was some angsty love story whose title I’ve yet to remember. I checked it out of the library five consecutive times that summer. As for books I can remember: Nancy Drew, Hardy Boys, Encyclopedia Brown and anything by Agatha Christie. (Do you see a theme?) Picture books, Dr. Seuss. Oh, and when our third grade teacher read us the Mrs. Piggle Wiggle books, yes! I rarely pick up non-fiction, but when it won all sorts of 2013 ALA awards, I was drawn to BOMB: The Race to Build–And Steal–The World’s Most Dangerous Weapon by Steve Sheinkin. It has it all: spies, geniuses, drama, intrigue, ticking clocks. You can’t make this stuff up. I’ve been asked a lot about writer’s block lately. Honestly? I refuse to recognize there’s such a thing. Sure, I may get stuck. Sure, I may not know where the story should turn next. Sure, I can feel somewhat stale at times. None of those, however, need to stop me from writing. I can always, at least, write one new sentence. It may not be good sentence, it may not be a sentence of any value, but the one after that might be. The one after that might be perfect. So what do I write in that sentence? That’s when I ask my character–or a random, imaginary person–a question. Tell me about some object you saw on your way home from school. How do you feel about waffles? What are you holding? That sort of thing. This gets them talking and gets me typing. Usually that will put me back on track. If it doesn’t, I go take a walk which somehow, magically, produces new ideas for me. I cook a lot, and I’m not afraid of cooking for crowds. This weekend, for example, though not a crowd, I’m cooking for ten. On the menu: triple cream cheese with mango chutney, Jarlsberg cheese spread, salmon rillettes, beef tenderloin with horseradish cream and cilantro chimmichurri, chicken and spinach canneloni, grilled vegetables, salad with homemade balsamic vinaigrette, fruit, carrot cake, and fudge pie with real whipped cream. MMMMmmm! Wish I were sitting at that table! Thanks for stopping by, Jody! I’m looking forward to reading the next Gollywhopper Games book! Jody Feldman, the award-winning author of The Gollywhopper Games series and The Seventh Level (all, HarperCollins/Greenwillow) may have enjoyed working as a treasure hunter, a codebreaker, a movie director, an artist and an inventor. But one thing she loves about writing–she can explore all those occupations and adventures with the characters in her books.A lifelong resident of St. Louis, Jody likes to travel, cook, watch football, and solve crossword-type puzzles. Oh, and she watches way too much TV. For more about Jody and her books, check out her web site, follow her on Twitter, or friend her on Facebook! As some of you know, this past fall we moved from my beloved home state of California to Connecticut for my husband’s job. After being evacuated from Hurricane Sandy, making it through a blizzard and several snow storms, and otherwise enjoying our rental on the ocean, we are thrilled to finally move into our new home sweet home. New to us, at least. The house was built in the early 1800s! My husband has always been very supportive of my writing career, and he knows how hard it is for me to move time and time again for his career. (This is the seventh move in sixteen years.) 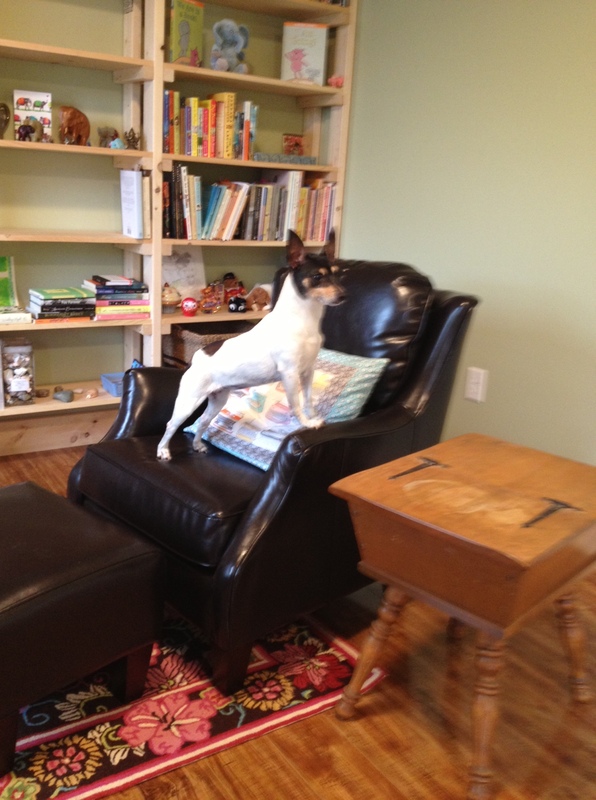 To show his great love and appreciation, he had a special studio built just for me and my writing/reading! 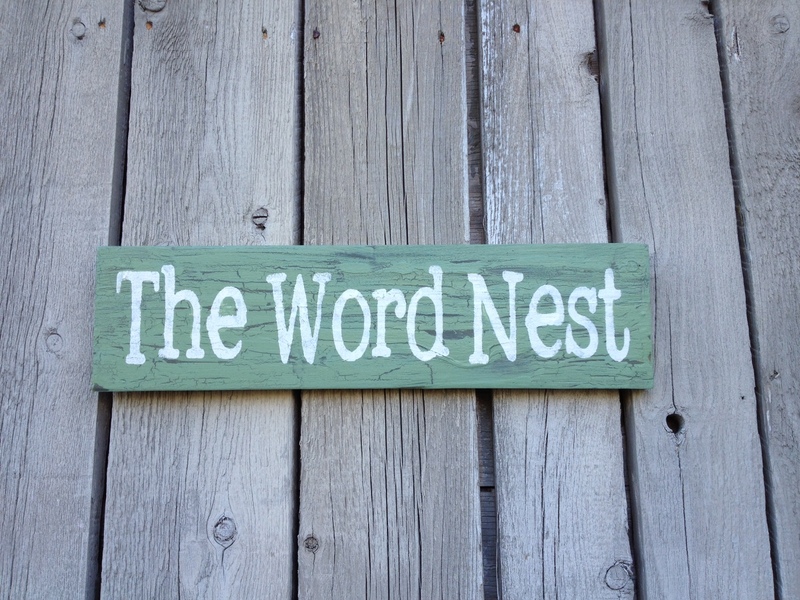 I’ve dubbed it The Word Nest (the area where we live is bird bountiful). As promised, here are a few before, during, and after photos! Many appreciative thanks to Mystic River Building Company and their amazing team and crew for creating and building this perfect space! The studio is a former wood shop, attached to the detached garage. It was not weather proof nor secure so the first thing we did was put on a new roof, and add new windows and a door with a lock. 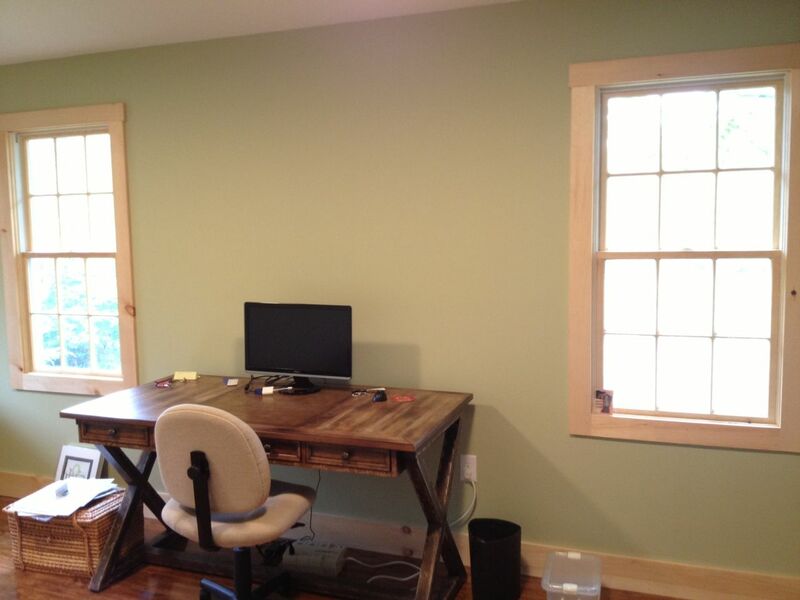 The original wood shop was not separate from the garage, so we added a wall, insulation, drywall, and paint and trim. No surprise that I have a ton of books so I needed space for them. And I wanted to make sure I had additional space for my constantly growing library. Trixie checks out the new space! Thanks to Amanda of GreenChickens for this awesome custom sign! Happy reading and writing! I know I’ll be happy working and reading in my cozy Word Nest! Thank you to everyone for stopping by to help me shine the spotlight on Sara Zarr and her new YA novel, The Lucy Variations! If you missed the interview, you can read it here! 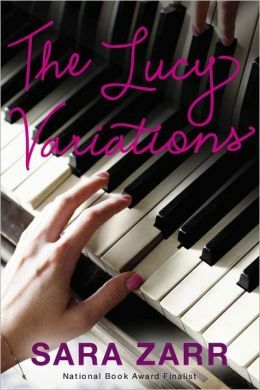 So, who is the lucky winner of a signed copy of The Lucy Variations by Sara Zarr? 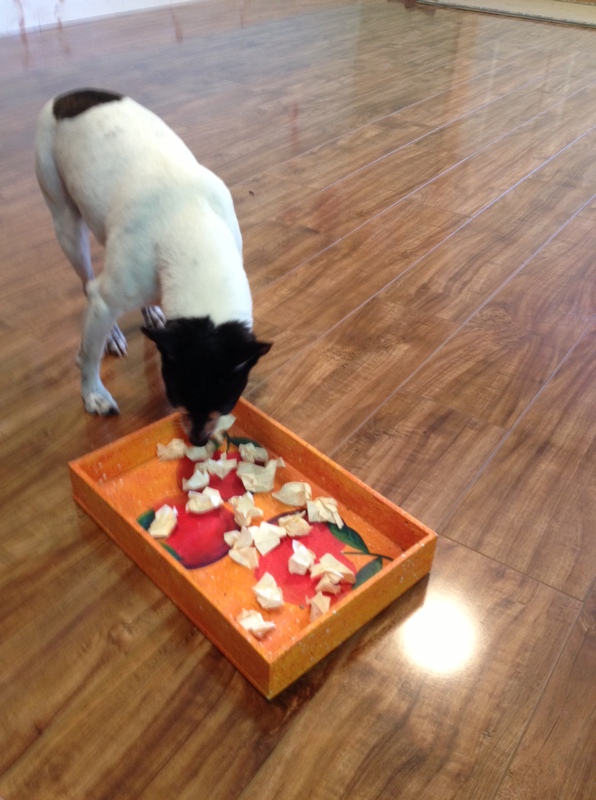 My faithful rat terrier, Trixie, was on hand to draw the winning name. I wrote the names on paper and crumpled them up, just how she likes them. She waited for the signal. It used to be a voice command of “Okay,” but she’s since gone deaf, so now it involves a lot of hand waving. After several exaggerated hand movements, Trixie realized I was telling her it was okay for her to pick the winning name. 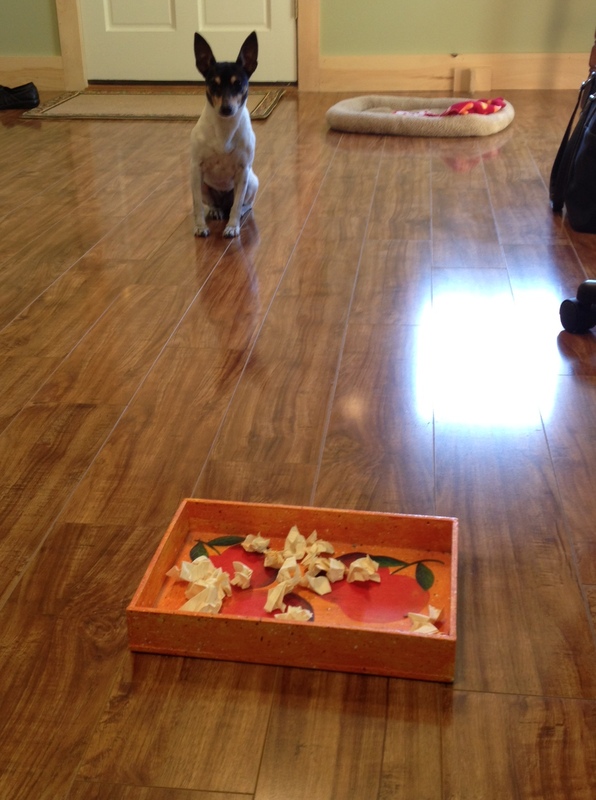 She went straight for one in the corner and pulled it out. 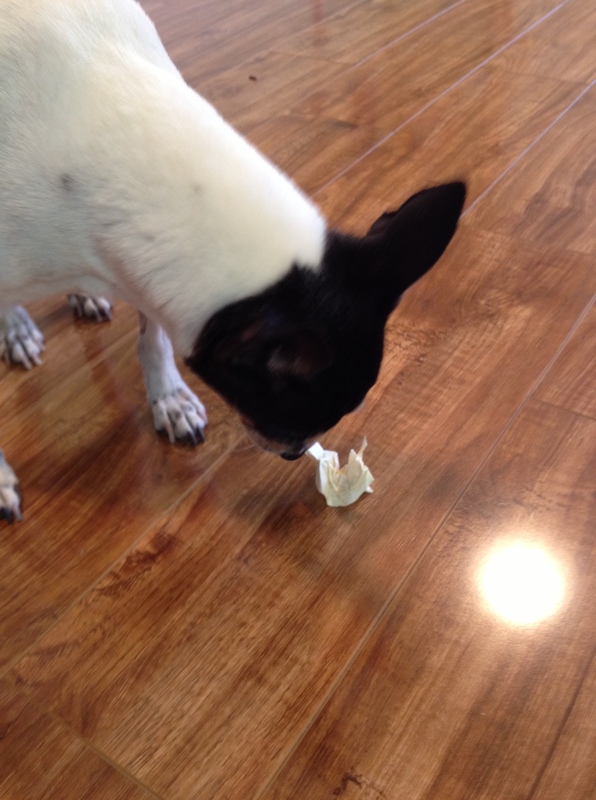 And the winner is…(drumroll please)…. Lucy of The Reading Date! YAY! Congratulations! Please contact me at just kid ink at yahoo dot com (no spaces) as soon as possible to let me know to whom you’d like the book signed and to give me your mailing address. I will be getting the book signed this evening so it’s important to get me the info ASAP! Thanks! Stayed tuned for more rave book reviews, interviews, and give-aways! Happy reading! 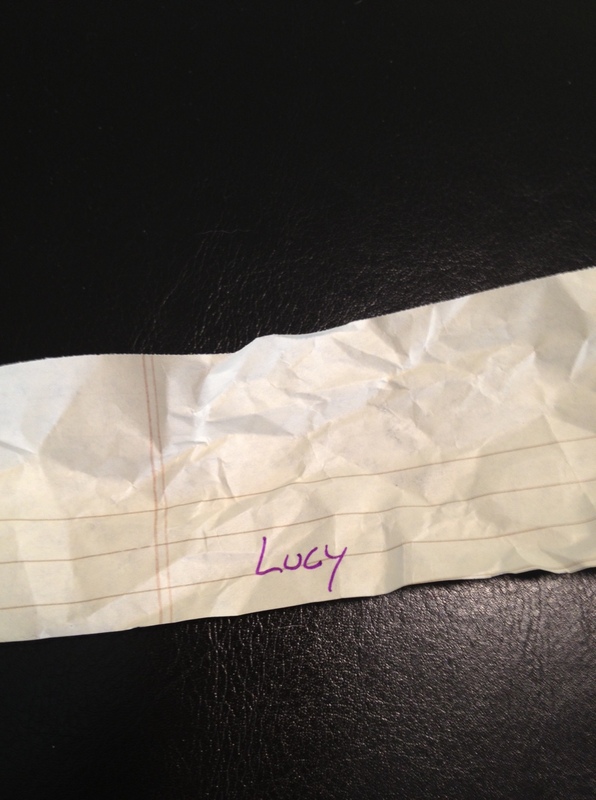 Update on the Give-away for The Lucy Variations! In case you missed it, I’m shining the spotlight on Sara Zarr’s newest YA novel, The Lucy Variations, right here. The update is that the winner will now receive a SIGNED copy! I’ll get to see Sara on Tuesday for her tour stop at RJ Julia Books! If you live near Madison, CT, be sure to stop by and see Sara, and look for me! To enter the drawing click on the link and follow the instructions: Spotlight on Sara Zarr. The winner will be announced on Tuesday – and be sure to check in right away if you want your book signed personally to you or someone else. Otherwise, the book will just be signed by Sara (which is awesome)! Thanks! Happy reading and good luck! Welcome to the Spotlight: Sara Zarr and The Lucy Variations! I’m thrilled to welcome back to the Spotlight, author Sara Zarr to talk about her brand new YA novel, The Lucy Variations! This amazing novel is on sale starting today – but stay tuned to see how you can win a free copy! Sixteen year old Lucy Beck-Moreau had it all and threw it away, at least that’s what her grandfather and parents think. A well-known and loved concert pianist, Lucy quit. Her gifted 10-year-old brother is now the focus, following her former path. His new piano teacher, Will, somehow sparks Lucy into thinking about her former love, and she wonders what it might be like to play again, without living under the heavy expectations and demands of her grandfather. Can Lucy find her own way, rediscover the joy, without being bogged down again by others’ expectations? And can she do it without hurting the ones she cares about the most? A story about finding joy on one’s own terms, Sara Zarr delves into the emotions of a character searching for herself and making mistakes along the way. I’m a huge fan of your work and am so happy to read a new novel by you! How did The Lucy Variations come about? What was the initial spark for the story and for Lucy? This book has been with me a long time, and it’s hard now to go back and identify that first spark. I know that I wanted a character in a family that was strongly identified by one thing, and see this character reject in some way the family’s identifying characteristic. I also knew I wanted to write about a teen girl in a life-changing relationship with an adult male mentor figure. Eventually these different interests came together (through some really different permutations along the way) into Lucy’s story. Lucy is a gifted pianist who loves music. How much research did you have to do for this novel? Do you play the piano or any other instruments? I didn’t play piano. I played clarinet, though nowhere near the level of Lucy’s skill or dedication. But music was a huge presence in my childhood, particularly classical music. My parents met in music school and both played and sang and led choirs and groups. So I already had a lot of familiarity with that kind of music and how passionate a person or a family could be about it. I did a little bit of research into the technical details, and at one point observed a master class–talented young pianists getting critiqued by a prestigious performer and conductor. That helped give the story some more texture. Lucy talks about her loves – particularly music. What are your Loves? It’s probably not surprising that a lot of Lucy’s loves are my loves. Her love list of music is basically straight from my own tastes. I love music. I love making meaningful connections with people. I try to love the world the best I can. For more about Sara and her books, you can check out her web site, follow her on Twitter, or find her on Facebook. For a previous Spotlight interview on Sara: click here. 1. Comment on this post, and for fun, tell me if you play any musical instruments! I don’t really play any, anymore, but I used to play the piano, clarinet, guitar, and accordion (yes, true). My husband recently bought me a keyboard and I’ve been slowly picking my way through my old piano music. Thank goodness it has headphones! 2. Leave your comment and email address by midnight EST Saturday, May 11th. The lucky winner will be drawn at random and announced here on Tuesday, May 14th.